Just a hair over two years after reaching its Kickstarter funding goal, the multiplayer game collection Sportsfriends is finally on its way to Steam—in fact, it'll arrive in just a few days. But with the good news comes a spot of bad: Despite the team's best efforts, Johann Sebastian Joust will not be included with the Windows version of the package. The problem, according to the most recent Kickstarter update, is the game's reliance on PlayStation Move controllers. In fact, trying to get them to work with PCs is a big part of why it's taken so long for Sportsfriends to make it out the door. But while the developers have been able to make Move controllers work reliably under Linux and Mac, Windows is a different matter. "Unfortunately, it seems like Windows is engineered in a way that makes it infeasible for us to get pairing working robustly. We looked for experts to help us, and even got in touch with an engineer at Microsoft, who told us 'this is NOT possible in any way shape or form'," the Sportsfriends team explained. "This means that, despite all our research, the Windows version of Sportsfriends will not support JS Joust." That's not necessarily the end of the line: They're still looking into creating a custom "JS Joust distro" of Linux that can be booted into via USB stick on Windows-based machines, and anyone who buys Sportsfriends is also entitled to the Mac and Linux versions. As far as playing it straight-up on your Windows-based gaming rig, however, it's just not an option. The omission is especially unfortunate because J.S. Joust is such a cool concept—players must jostle an opponent's Move controller while preventing others from doing the same to theirs—and the launch trailer quite clearly presents it as the central game in the bundle. In its defense, however, Die Gute Fabrik stated in the original Kickstarter pitch that "due to Bluetooth issues, native Windows support for J.S. Joust may not be possible," so this shouldn't come as a complete surprise. 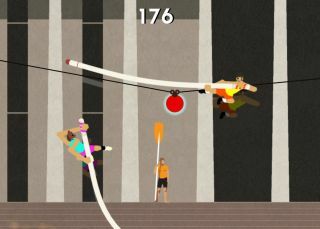 Sportsfriends launches on December 19 on the Steam and Humble Store.